As promised, hope you enjoy this wonderful piece written by Lela Lake on "The Prettiest Places in Paris". Lela has me itching to go back and check these spots out! Don't forget to visit the links at the bottom of the post. Thanks Lela! Paris is crammed with awe-inspiring monuments, sparkling vistas and fabulous museums -- but the prettiest places occur when natural wonders blend with human talent to make islands of tranquility in the busy urban landscape. Hidden among the popular tourist traps are lovely secret enclaves that even native Parisians may have not yet discovered. 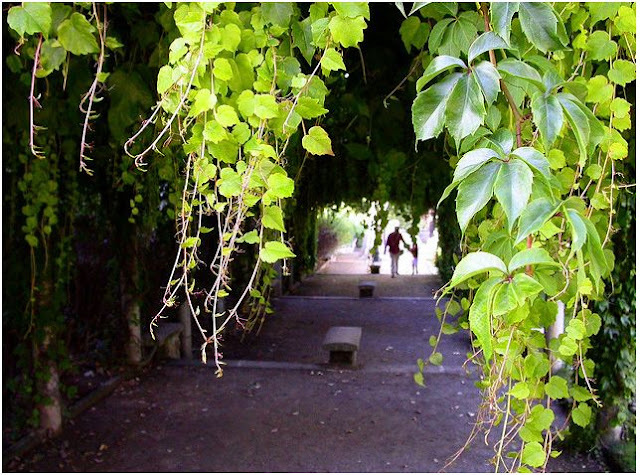 Tucked away near the National History Museum is a secret garden accessible only by a tunnel under the main path of the Jardin des Plantes. Many visitors miss the Jardin Alpin altogether because it is hidden by thick hedges from public view. Within this unexpected paradise is an artificially controlled micro climate that allows over 2,000 species of high elevation plants to thrive in a setting that makes you think you are roaming the slopes of the Himalayas or Rocky Mountains instead walking around downtown Paris. Complete with babbling brooks and small sparkling waterfalls, the benches secluded by dense foliage are like islands of isolation that make the bustling city nearby seem very far away. Who would have thought that a rusty old elevated train track could be turned into a bastion of beauty? 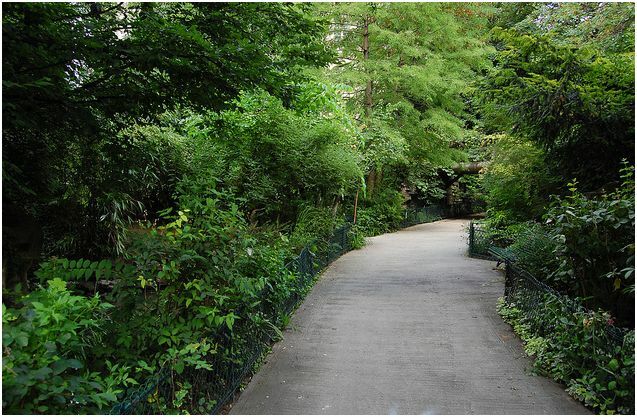 But the talented gardeners who conceived and executed the lovely Promenade Plantee had a vision that resulted in a 2.8 mile (4.5km) suspended greenbelt that has become a favorite place for Parisians to stretch their legs and bask in the dappled shade. Majestic cherry trees line the path while thick wisteria vines create a wall of foliage that muffles the city sounds below. The quaint shops and cafes at the western end of the promenade invite you linger in the lush atmosphere created by this surprisingly pretty place in Paris. Visitors to the famed Sacré-Coeur basilica are often so awed by this magnificent edifice that they automatically follow the crowds to the nearby tourist traps instead of turning the other direction to discover the hidden Parc de la Turlure. This triangle shaped patch of green comes complete with its own waterfall and cool green-draped walkways that are bordered with magnificent flower beds. Comfortable benches provide a perfect place to curl up and read in solitude. Just off the famed Champs-Élysées is a hidden treasure known as the Jardin de la Vallée Suisse, a lovely hideaway full of enchantments. The first thing you realize is that amid the beautiful bamboo stands, exotic fruit trees and koi ponds the natural wood bridges and walkways are not wooden at all! Instead they are made of durable concrete cleverly designed to blend into the surroundings without suffering the inevitable rot. The smells drifting from the lilacs and Mexican orange trees add to the hypnotic affect of watching the fish swim lazily in the ponds fed by the Seine -- but the appearance of the resident otter might snap you out of your trance. Rarely found by tourists, this idyllic refuge offers proof that even concrete can be beautiful! About the author: Lela Lake writes for AnyTrip.com, the budget travel specialists. Looking for a hotel in Paris? Visit cheap Paris hotels. Very interesting! I had no idea about these locations.